Offering you a complete choice of products which include Skin Care Ointments such as Tretinoin Cream, Benoquin Monobenzone Cream, Mupirocin Ointment, Dapsone Gel, Kenacort (Triamcinolone Acetonide), Demelan Cream and many more items. AVARTA CREAM 50G side effects are because of Anatomical Therapeutic action which we can find in its atc code. AVARTA CREAM 50G dosages – specified by physician as. 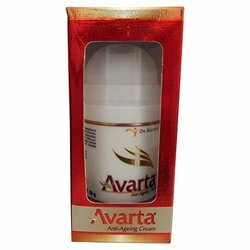 AVARTA CREAM 50G – 50G uses are in various complications related to ATA (anatomical therapeutic action). 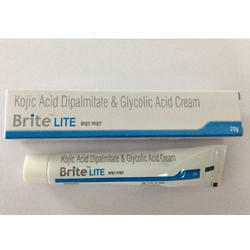 Brite Lite contains Glycolic Acid 5% Kojic Acid 2%. Used for treatment of post-inflammatory hyperpigmentation, melasma and hyper-melanotic skin pigmentation disorders. 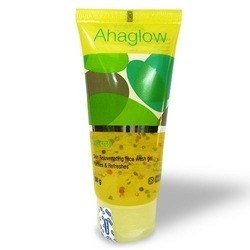 Ahaglow contains Aloevera Glycolicacd Gel. It contains a medicine called pimecrolimus. It does not contain any steroids. 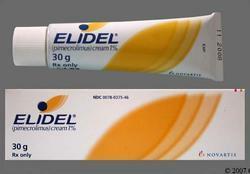 Pimecrolimus specifically treats an inflammation of the skin called atopic dermatitis (eczema). It works in the cells in the skin that cause the inflammation and characteristic redness and itching of eczema.The is used to treat signs and symptoms of mild or moderate eczema (e.g. 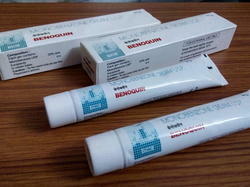 redness and itch) in children (aged 2 years and above), teenagers and adults. When used to treat early signs and symptoms it can prevent progression to severe flare-ups. Pimecrolimus is for use only after other prescription medicines or emollients have not worked for you or if your doctor recommends that other prescription medicines should not be used. Leveraging upon our vast industry experience, we are engaged in wholesaling, trading and supplying A-Ret Gel that is prescribed to treat acne. 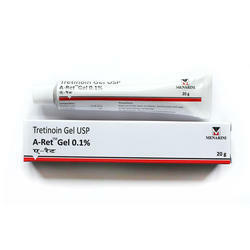 The offered gel is a skin acne treatment which works by helping to maintain the cleanliness of the pores. Also, the offered gel is packed in safe packaging option in order to provide safer delivery at customer’s end. Cetaphil is a seriously gentle therapeutic skincare range, specially formulated for all skin types (including dry and sensitive) to provide effective, gentle skincare to help your skin look and feel its best. 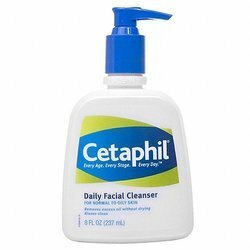 Cetaphil is also a perfect partner to treatment for specific skin conditions; eczema, acne, rosacea and psoriasis. Cetaphil Gentle Skin Cleanser cleanses, moisturises and gently removes what your skin doesn’t need, without stripping away the skin’s natural protective oils, and without disturbing the skin’s natural pH balance. Cetaphil offers gentle and thorough cleansing without the irritation associated with harsh soaps. Aqua/water, Cetyl alcohol, Propylene glycol, Bulylparben, Methylparben, Propylparben, Sodium lauryl, Sulfate, Stearyl alcohol. 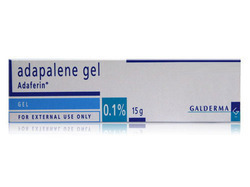 Differin/Adaferin gel 0.1% is used to treat acne vulgaris of the face, chest or back, including pimples, whiteheads and blackheads (comedones) and can also be used to treat acne cysts, which can be deep, painful and inflamed. Differin/Adaferin gel 0.1% gel helps combats the processes in the skin that cause clogged pores and lead to pimples and spots associated with acne, helping to clear up these skin blemishes as well as preventing the outbreak of new acne. Differin/Adaferin gel 0.1% contains adapalene, which is a retinoid-like compound and a keratolytic medication that binds to specific retinoic acid receptors in the nucleus of skin cells and changes the way they behave. Acne is often associated with puberty which is when a surge of androgen hormones can over stimulate the sebaceous glands (oil producing glands in hair follicles). Skin cells that are shed from the lining of the hair follicle become trapped in sebum forming a plug below the surface of the skin, clogging the pores, which then attracts bacteria, so that the clogged pores become infected and inflamed, causing an acne outbreak. Differin/Adaferin gel 0.1% penetrates deep inside your pores to control the buildup of dead skin and sebum that leads to acne and also blocks the hardening processes of the outer skin layer (keratinisation and cornification) promoting the shedding of old hardened skin cells, while at the same time promoting growth of new skin cells. Differin/Adaferin gel 0.1% also blocks immune cells getting to the site of acne formation which inhibits the inflammatory reaction. This stops pores becoming clogged, infected and inflamed, reducing the outbreak of new pimples, whitehead and blackheads (comedones) as well as clearing up existing blemishes. 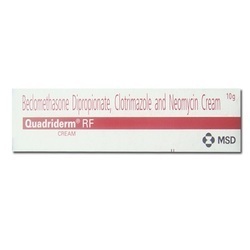 How Quadriderm RF Cream works Beclometasone topical is a topical corticosteroid (anti-inflammatory medicine). It works by reducing redness, itching, and swelling caused by various skin conditions. How to use Beclometasone TopicalThis medicine is for external use only. Use it in the dose and duration as advised by your doctor. Check the label for directions before use. Clean and dry the affected area and apply the cream. Wash your hands after applying, unless hands are the affected area. 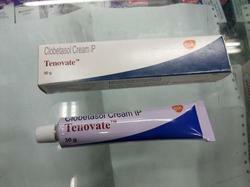 How Tenovate Cream works Tenovate 0.05% cream is a topical corticosteroid (anti-inflammatory medicine). It works by reducing redness, itching, and swelling caused by various skin conditions. How Candid-B Cream works Beclometasone topical is a topical corticosteroid (anti-inflammatory medicine). It works by reducing redness, itching, and swelling caused by various skin conditions. How to use Beclometasone Topical This medicine is for external use only. Use it in the dose and duration as advised by your doctor. Check the label for directions before use. Clean and dry the affected area and apply the cream. Wash your hands after applying, unless hands are the affected area. 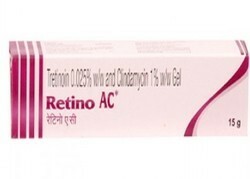 How Retino AC Gel works Clindamycin topical is an antibiotic. It stops bacterial growth by inhibiting synthesis of essential proteins, which are required by bacteria to carry out vital functions. How to use Clindamycin Topical Use this medicine in the dose and duration as advised by your doctor. Check the label for directions before use. Apply it on the affected area and allow it to stay before spitting or rinsing. 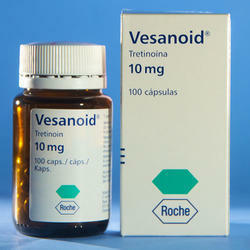 How Vesanoid Capsule works Vesanoid 10 mg capsule works by slowing the production of certain natural substances that can cause acne. Considering our enormous experience and knowledge in this domain, we are well known for offering Benoquin Cream in the market. Our offered entire range of products including Monobenzone Cream durable for long time period and user will feel pleased after the use of this product. Backed by rich industry experience, we are highly engaged in offering an optimum range of Elovera Gel. You can apply it while going outside for getting rid from sunburn, this eloevera gel is processed with the help of premium quality ingredients and sophisticated processing techniques in accordance with set medical standards. 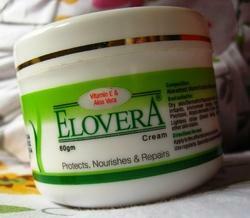 Our offered eloevera gel helps to get rid of skin related problems. 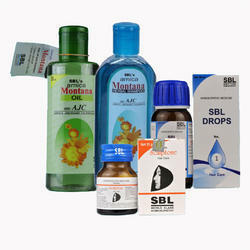 Information about SBL 116 Hair Care Pack (Combo OF 4)Sbl'S Hair Care Pack contains Scalptone Tablet, Arnica Montana (Sbl) Herbal Shampoo, Arnica Montana Hair Oil and Sbl Drop No. 1 Hair Care Drop. Scalptone Tablet contais Acidum fluoricum 3x, Acidum phosphoricum 3x, Natrum muriaticum 3x, Calcarea phosphorica 3x and Badiaga 3x. Scalptone is used for excessive hair loss can be caused by dandruff, genetic factors, diseases, stress, medications, under or over activity of sebaceous glands and ageing. Scalptone is a combination of well proven drugs of homoeopathic therapeutics to keep hair roots healthy and prevent hair-loss. Adults- 4 tablets, 3 times daily, Children- Half of the adult’s dose Or as prescribed by the physician. SBLs Arnica Montana herbal shampoo is formulated using herbal extracts of Arnica, Calendula, Thuja and Jaborandi. Developed specially for dry and coarse hair to give them shine and making them manageable. Arnica Montana hair Oil is suitable for all kind of hair loss. Arnica Montana Oil is prepared from Homeopathic medicines that help in controlling hair fall and also promotes hair growth. Regular use of this Hair oil stimulates the active phase of a hair growth cycle, induces quick multiplication of hair fibre cells, improves the strength of the hair and increases hair density. Sbl Drop No. 1 Hair Care Drop is composed of Arnica montana 3x - 20%, Acidum phosphoricum 3x - 20%, Lycopodium clavatum 3x - 20%, Alcohol purified water q.s. It is indicated for Hair fall, dandruff, itching and irritation on scalp. 10-15 drops in 1/4 cup of water 3-4 times a day Or as prescribed by the physician. Eflornithine interferes with a chemical in the hair follicles of the skin. This results in slower hair growth where eflornithine topical is applied. Eflornithine topical is used to reduce unwanted facial hair in women. Eflornithine topical does not permanently remove hair or "cure" unwanted facial hair. 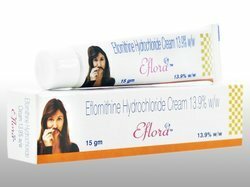 Eflornithine topical will help you manage your condition and improve your appearance. Eflornithine topical may also be used for purposes other than those listed in this medication guide. 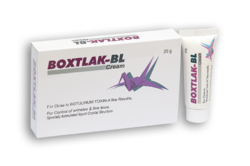 We are the foremost wholesaler, trader and supplier of highly effective Adapalene Topical Cream. The offered creams are processed under the supervision of vendor’s pharmaceutical experts in adherence with set medical industry standards. As well, these creams including its uses, pictures, warnings, side effects and safety, interactions and user ratings. These creams are offered in tamper proof packing at nominal price. 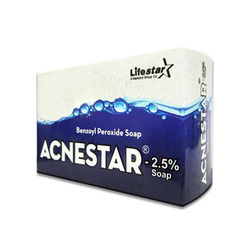 Acnestar soap is used to treat acne and blackheads and spots. Efaderm Skin Cream is used for Skin moisturization, Maintaining the skin's moisture level, Acne vulgaris, Arrhythmias, Burn injuries, Ocular surface discomfort and other conditions. 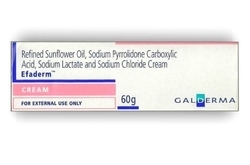 Efaderm Skin Cream may also be used for purposes not listed in this medication guide. Efaderm Skin Cream contains Linoleic Acid Topical, Sodium Chloride Topical, Sodium Lactate Topical and Sodium Pyrolidone Carboxylic Acid Topical as active ingredients. Efaderm Skin Cream works by effectively healing burn injuries; reducing ocular surface discomfort; showing antibacterial activity; nourishing and moisturizing the skin; suppressing the melanogenesis in vitro; Detailed information related to Efaderm Skin Cream's uses, composition, dosage, side effects and reviews is listed below. Efaderm Skin Cream may also be used for purposes not listed here. 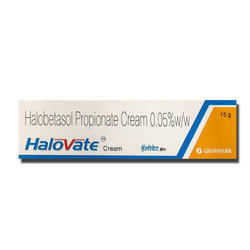 How Halovate Cream worksHalovate 0.05 % cream is a topical corticosteroid (anti-inflammatory medicine). It works by reducing redness, itching, and swelling caused by various skin conditions. How to use Halovate CreamThis medicine is for external use only. Use it in the dose and duration as advised by your doctor. Check the label for directions before use. Clean and dry the affected area and apply the cream. Wash your hands after applying, unless hands are the affected area. How Picon Cream works Picon 30 1% cream is an immunosuppressant that works by decreasing inflammation in the skin which causes redness and itching of the skin. Side effects of Picon Cream Application site reactions (burning, irritation, itching and redness), Skin infection. How to use Picon CreamThis medicine is for external use only. Use it in the dose and duration as advised by your doctor. Check the label for directions before use. Clean and dry the affected area and apply the cream. Wash your hands after applying, unless hands are the affected area. Information about Ilumax CreamIlumax Cream is a skin care product which contains Niacinamide, Phenoxyethanol, Chlorphenesin, and Benzoic acid. 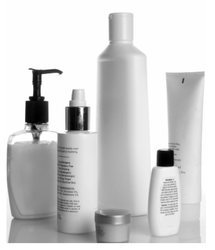 Phenoxyethanol is glycol ether used as a preservative in cosmetic products and medicines. This is a kind of ether alcohol with aromatic properties that can enhance a skin product?s scent. Chlorphenesin helps to prevent or retard the growth of microorganisms, and thus protects the product from spoiling, also function as a cosmetic biocide, which means that it helps prevent the growth of microorganisms on the skin which reduces or prevents odor. Benzoic acid helps prevent infection caused by bacteria. Benzoic acid is used to treat skin irritation and inflammation caused by burns, insect bites, fungal infections, or eczema. 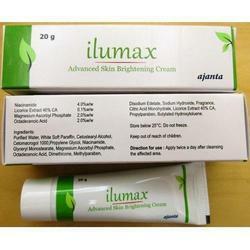 Ilumax Cream is used for topical purposes. How Hyde Cream worksHyde 3% cream belongs to the class of medications called as melanin synthesis inhibitors. It bleaches the skin by reducing the accumulation of skin pigment called melanin that causes darkening of the skin. Uses of Hyde CreamHyde 3% Cream is used in the treatment of hyperpigmentation and melasma. Use of sunscreen is a must while using hydroquinone topical. Avoid unnecessary sun exposures and cover the treated areas with clothing. Even minimal exposure to sunlight can reverse the bleaching effect of hydroquinone. Discontinue use and contact your doctor immediately if you develop allergic skin reaction or notice blue-black darkening of skin upon use of hydroquinone. Avoid direct contact of cream with your eyes. In case of direct contact, wash your eyes with water immediately and seek immediate medical attention. 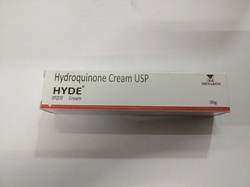 Do not use hydroquinone creams on broken, irritated or injured skin. Do not use hydroquinone creams with other creams that contain peroxides (hydrogen peroxide/benzoyl peroxide), resorcinol, phenol, or salicylic acid as it may cause unwanted side effects. Use in children aged below 12 years is not recommended unless under the strict supervision of doctor. Tell your doctor if you are pregnant or planning to become pregnant or breastfeeding. It should not take if patient is allergic to hydroquinone or any of its ingredients. With a thorough understanding of this industry and the assistance of our skilled team, we are engaged in offering a broad collection of Cleansers to our customers. Looking for Skin Care ?